The TaylorMade R1 Driver can be tuned to fit tour pros and amateurs alike. It can be tuned to any loft, any look, and any flight. 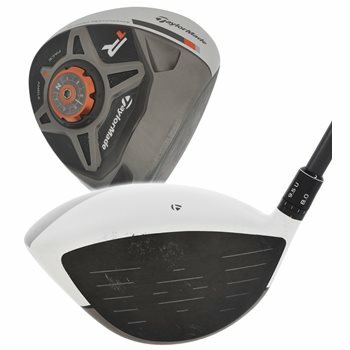 This driver has 7 standard and 5 upright loft options from 8-12 degrees. It has 7 face angle options (square, open, medium-open, maximum-open, closed, medium-closed, maximum-closed) as well as movable weights to promote a neutral/straight flight or a distance-enhancing draw. This driver also features a lower and more forward CG to promote a high launch, fast ball speed and low spin. The result is one driver that can be full adjusted to fit any player. One driver model that can be tuned to fit Tour pros and amateurs alike. 7 standard and 5 upright loft options between 8º and 12º (±2º) to obtain optimal launch angle. 7 face angle options: N/square, open, medium-open, maximum-open, closed, medium-closed, maximum-closed. Shot-shaping movable weights promote a neutral/straight flight or a distance-enhancing draw. Thick-thin crown provides lower and more-forward CG location promoting high launch, fast ball speed and low spin. Inverted Cone Technology milled into the inner side of the clubface expands the portion of the face that delivers high ball speed. Black clubface, non-glare white crown and new gray/orange/ black crown graphic together promote easy alignment. Improved aerodynamics reduce drag over the head to promote faster clubhead speed. Review by golferguyer29, 3 years ago. Does this shaft have the same adapter to fit the Jetspeed driver? It looks like we currently have right and left handed available. If you click on right hand next to dexterity, only right handed options will be shown.